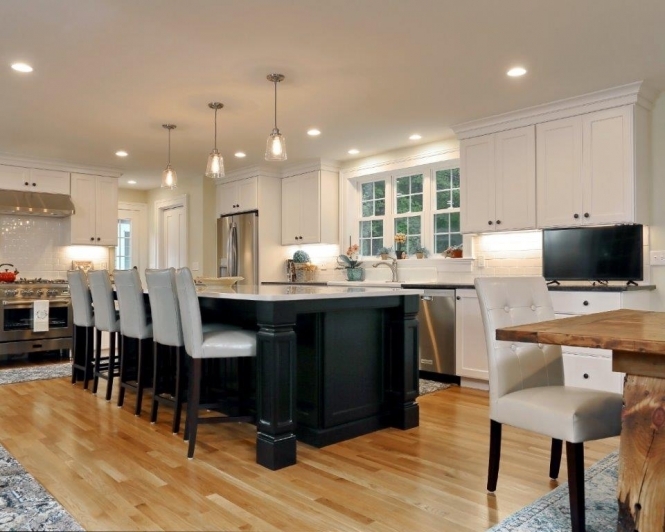 The Farmhouse Modern Craze - Wood Palace Kitchens, Inc. I speak to a lot of clients about the movement in the fashion world today with the Farmhouse/Modern trend. I can’t tell you how many kitchens I design in that same style. Many of these clients ask me, how do I define that style today and how will they know if that is their actual style. In the world of design, my job is to ask the right questions and listen carefully to my clients’ responses to put together exactly what their minds are thinking, because most clients don’t really know what their taste is. Here’s how I define what I hear. like my grandmother’s kitchen cupboards! 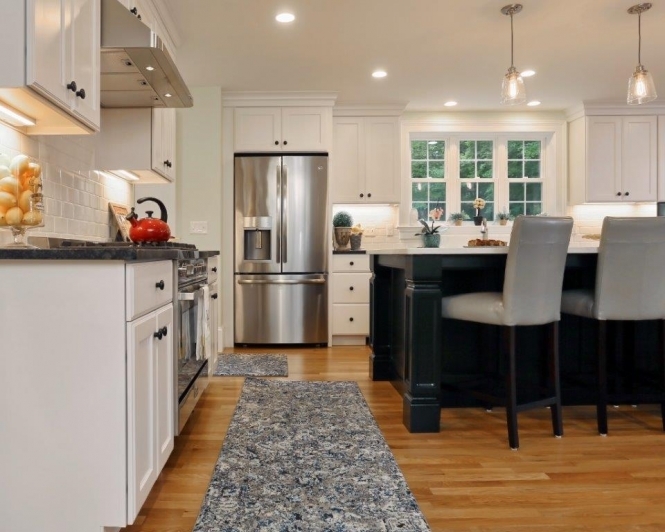 This month’s featured kitchen shows many likenesses to these answers. 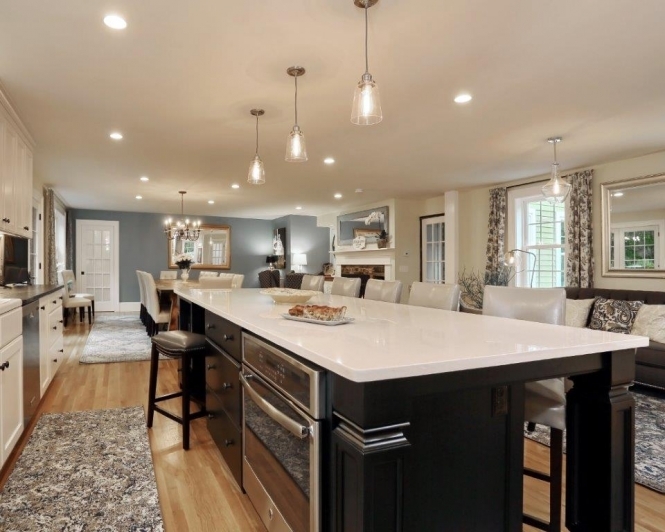 From the old porcelain counter top sink to mixed colors and materials, to a furniture-like island. We used large post legs on this island because of the size of the room and the island. Smaller legs would have been dwarfed by each. Notice the apron pieces we used to tie the legs together which would be like an older farmhouse table. I find many designs in magazines and social sites like Houzz that show legs without these apron pieces and they look naked. A leg should never be sitting alone. 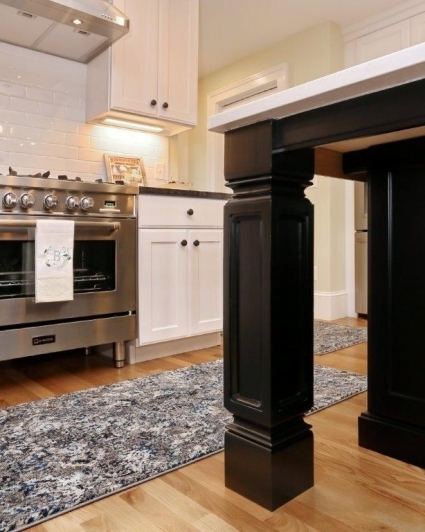 We also coupled these legs with some nice wainscoting on the ends of the island, creating that furniture look, and painted it black, which gave it a nice contrast. The doors of the kitchen were modern, but still have that older farmhouse flair with the ogeel shaped bead on the inside edge. My client chose a larger edge detail around the outside of the doors and drawer fronts to give it that older flare but still spelled clean lines. We ended up using the old porcelain sink counter from the old kitchen and tied it into the nice, old-looking, dark Steel Grey granite tops. It ended up looking like they grew together. Another aspect of that old farmhouse look was the table that she had someone make out of the old beams from part of this historic home that they tore down and replaced with the new addition. It really added to the home’s historic past. The resulting kitchen is a nice blend of the clean, modern lines and the charm of an old farmhouse. Today’s look with a flair of yesteryear. That’s why it is so important to Dream First so that these style come out of your head for me to see what is up there. Too often other designers in the industry try to push you into what is cheap or what they feel you should have. You will be living in the room for many years, so that alone makes it important to capture what your mind is thinking. I find nothing more gratifying then when my clients feel that they were not only heard, but someone was also able to put it all together to create the room of their dreams. Spring is here, along with our 40th Anniversary, so if you know anyone who is looking to create a room that not only captures the look in their minds but also functions for their lifestyle today, have them give us a call. We would be honored to help one of your friends or family get that room. 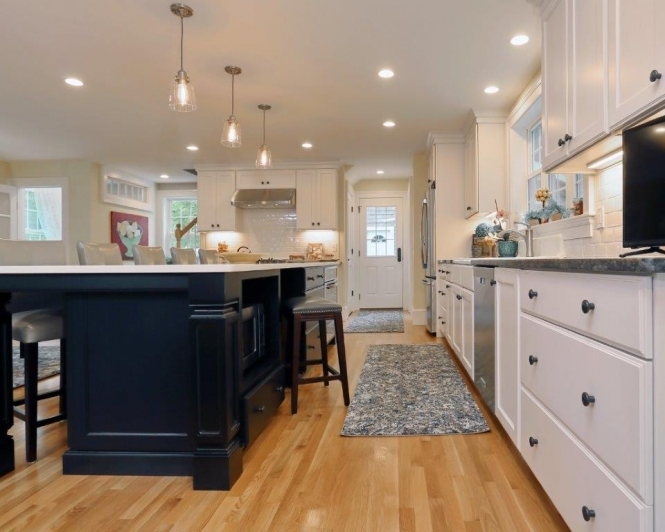 This entry was posted in kitchen design on April 11, 2019 by wpalace.